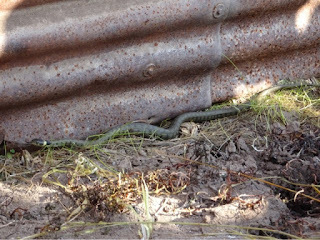 The Grass snake is also known by some as the ringed or water snake. We didn't realise this until researching this snake after seeing this one whilst out with the warden at Slimbridge WWT the other day. Apparently grass snakes are often found near fresh water and feed most on amphibians. This was one of two warming itself underneath this tin sheet. Later as temperatures drop they will look for places to hibernate that won't freeze such as underground.